A concerto is a classical musical arrangement where a solo instrument is contrasted with an orchestra, i.e. it’s as if there is a dialogue between the soloist and the orchestra. We merge a piece of “Carolan’s Concerto” with the children's nursery rhyme “Sing a Song of Sixpence” to create a regal sounding song. Turlough O’Carolan, born in 1670, was a blind Irish harpist who travelled Ireland composing music for wealthy patrons. He wrote his concerto for Mrs Power who was the wife of one of his patrons. Click on the play arrow above to listen to our version of Sing a Song of Sixpence set to Irish music for kids. 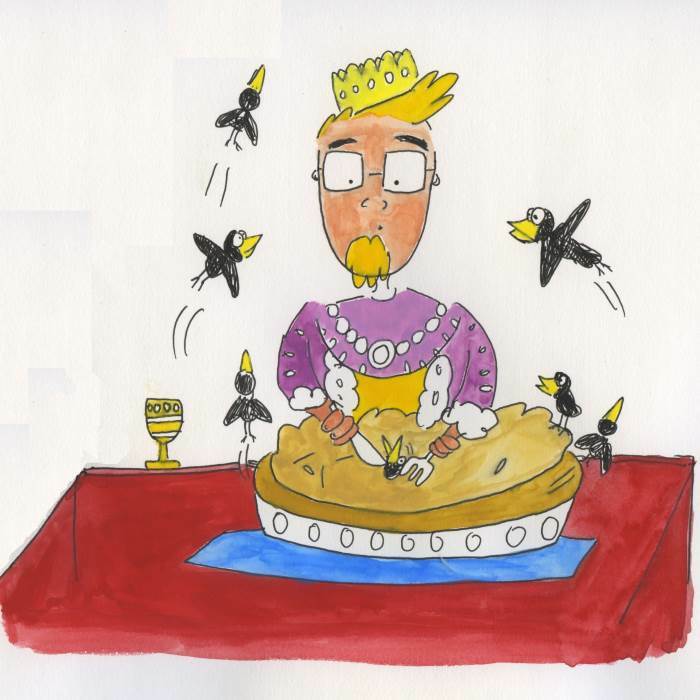 Go to The King's Concerto page where you can share our nursery rhyme with your friends and/or get it as a free MP3 download. Social, Environmental and Scientific Education/History: Who are the best known kings and queens from the past? Examine their role in society at that time. How was society structured then? What was their lifestyle? What were their best achievements? What were their worst ones? Art: Illustrate the king in his counting house, the queen in the parlour and the maid in the garden. Draw a castle or a palace. Introduce the colours of royalty, e.g. purple, red and gold, etc. Drama: Make king and queen costumes. Dramatise the movements of kings and queens. Enact a regal procession to this song.